This volume examines the evolution of the policies for cooperation between civilians and military in crisis management, and between NATO and the European Union. Key for this cooperation is the cooperative development and the level interoperability between technologies used and C4ISR systems. The first part of the volume looks at cyber defence, counter IED, intelligence sharing, and language technologies and joint experimentation. The second part focuses on IT support to civil security and the implementation of the comprehensive approach to maritime security. Editorial. "C4ISR Support to the Comprehensive Approach." 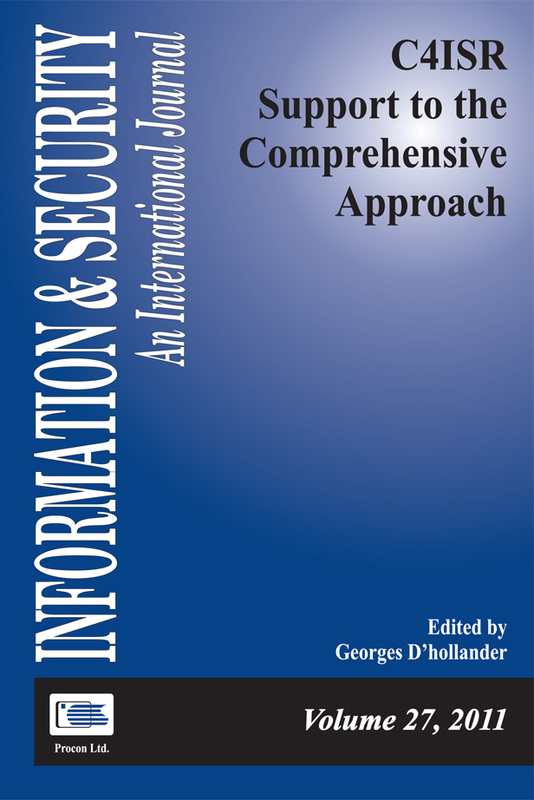 Information & Security: An International Journal 27, no. 1 (2011): 5-6. Achkoski, Jugoslav, Metodija Dojchinovski, and Vladimir Trajkovik. "An Intelligence Information System based on Service-Oriented Architecture: A Survey of Security Issues." Information & Security: An International Journal 27, no. 1 (2011): 91-110. Synytsya, Kateryna, and Greta Keremidchieva. "Language Assistance to Multinational Partners in Coalition Operations." Information & Security: An International Journal 27, no. 1 (2011): 111-120.